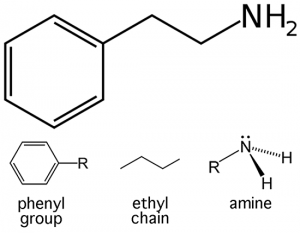 Phenethylamine (PEA) is both a molecule of its own and a base structure for many psychoactive compounds. Aldimines have been found in cocoa powders, which arise from the condensation of phenylethylamine and serveral aldehydes in cocoa. The main component of these products is N-phenylmethyl-N-phenylmethylene amine a condensation product of phenylethylamine and the aldehyde benzaldehyde. As much as 20 different aldehydes were found to occur in cocoa beans. The main aldehydes found were benzaldehyde (2.26%) and benzenacetaldehyde (1.5%). Acetic aldehyde, isobutyric aldehyde, propionic aldehyde, butyric aldehyde and others made up only 0.1-0.35% of the beans. If correctly activated PEA will produce a peaceful yet not necessarily sedated experience. It produces a state of bliss without a crash, due to its initial antagonism of GABA-B and the subsequent upregulation of GABA-B. It is not a stimulant in the sense of amphetamine because of its alpha-adrenergic agonism, though it retains the ability to increase heart rate. It is not addictive due to its D2 agonist and GABA-B and NMDA antagonist actions which block dopamine impulses in the nucleus accumbens. It does not inhibit VMAT like amphetamine and methamphetamine, and therefore does not release dopamine in an addictive manner. PEA's D2 agonism produces a slightly dissociated psychedelic effect with cartoon-like visuals. This is weak but noticeable. Increased heart rate. Possible vasoconstriction, sedation, and anxiety at high doses. PEA is produced within dopamine neurons and stored within the vesicles of those neurons. CB1 receptors have been shown to cause an endogenous release of phenethylamine, boosting concentrations up to four times above baseline. This is theorized to be the primary effect of CB1 agonism: endogenous PEA release. Solubility: Soluble in cold water. Insoluble in diethyl ether. Soluble in alcohol.